Jim McDonough is truly a master at his craft. He likes Lego, boats and naval history. And when these passions combine, magic is made. 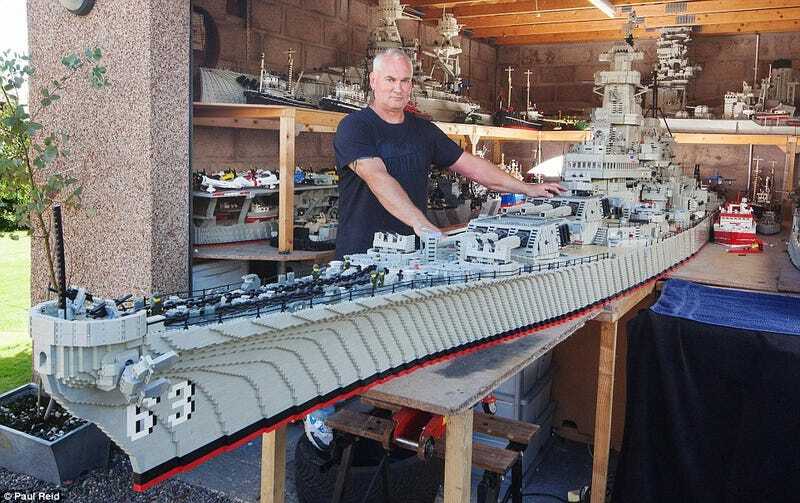 McDonough’s epically huge, ridiculously well-detailed Lego navy boats are the stuff of legend. For the past three years, the Scottish fisherman has been building the 1:40 scale replica of the iconic WWII vessel. The USS Missouri is an Iowa-class battleship that fought in the Pacific Theater, notably at Iwo Jima and Okinawa, and where the Japanese formally surrendered to the United States. She also fought in the Korean War, after which she was decommissioned. Then in the mid-80s was reactivated and provided support during Operation Desert Storm. She’s been decommissioned since 1992 and is now a museum ship that you can visit at Pearl Harbor. I used to teach on base there and visiting the Missouri was always pretty damn remarkable. And boy, is this baby HUGE! Ooh, now look at this super adorable photo! For his next project, McDonough is going to build a model of the USS Saratoga. You’re reading Leg Godt, the blog with the latest Lego news and the best sets in the web. Follow us on Twitter or Facebook.